This newsletter was published on May 9, 2018. 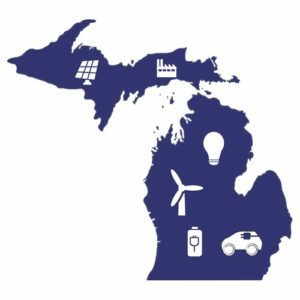 On May 1, Michigan EIBC member companies spread out across the Capitol to discuss advanced energy issues with Michigan’s legislature. Ten Michigan EIBC member companies sent eighteen people who gathered at Dykema’s offices bright and early to prepare for the busy day. Two teams met with members of the House Energy Committee, House and Senate Local Government Committees, House Tax Policy Committee, and Senate Finance Committee, as well as House and Senate leadership. In meetings with more than 20 representatives, EIBC members discussed the benefits that their companies bring to Michigan communities, the need for tax certainty for advanced energy, and ongoing efforts to improve market opportunities and remove barriers for advanced energy deployment. Members expressed their support for two bills introduced by Rep. Barrett (HB 5143 and HB 5680) that were favorably voted out of the House Tax Policy Committee on May 2. We also expressed support for recently introduced bills (HB 5692 and HB 5693) that would remove the distributed generation tariff and return to net energy metering for rooftop solar customers. Overall, EIBC was well received by the legislators and we had many productive conversations. Michigan EIBC staff, and representatives from Michigan CAT and Lean & Green Michigan attended the formal bill signing. Yesterday, Governor Rick Snyder ceremonially signed SB 375. The bill was championed by Sen. Darwin Booher (R-Evart) and backed by Michigan EIBC after member companies brought the shortcomings of the Property Assessed Clean Energy Act (2010 PA 270) to light. The new PA 242 of 2017 adds “anaerobic digester” as an option for energy projects that can be financed through PACE by the legislation. Anaerobic digesters collect agricultural waste, such as manure, food processing waste, and waste from other sources, and convert the energy stored in the waste’s organic matter into methane. The methane is then used to produce either gas or electricity. Last year, Michigan EIBC participated in hearings on the bill with members Michigan CAT, Lean & Green Michigan and Petros Partners testifying in the Senate Local Government and House Agriculture committees. At the end of 2017, the Michigan legislature unanimously passed the bill. 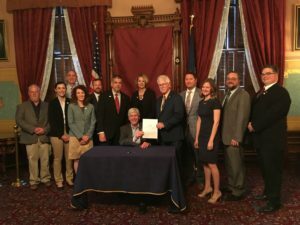 Michigan EIBC is grateful to have worked with Senator Booher and legislators in both the House and the Senate to work toward the passage of this bill. The new law signed yesterday will give companies like Michigan CAT, Lean & Green Michigan, and Petros Partners the opportunity to install and finance anaerobic digesters for clients who want them. Michigan lost a hero for our Great Lakes and natural resources last week. Famous for her signature purple, the late Senator Patty Birkholz’s passing leaves a gap where her friendship was, as well as mentorship and leadership on policy issues of energy, water and the environment. Patty and I met when I staffed her Senate Natural Resources and Environment committee for the other side of the aisle. She was warm and welcoming to a newcomer to the policy world and she demonstrated how to operate an efficient, productive legislative committee with her calm approach. She always engaged different viewpoints, but firmly used her egg timer when testifiers were wearing out their welcome. Patty led on critical energy issues that shape Michigan’s energy future today. Patty was lead sponsor on the 2008 energy rewrite, including supporting and advocating for the first round of Michigan’s Renewable Portfolio Standard (RPS) at a time when few clearly saw the downward trajectory of renewable energy prices. She fought for the 50/50 split to create competitive pressures in the renewable build. She supported the first energy efficiency (optimization) standard in Michigan and spent hours working with the business community to make sure their concerns were met. Patty is the reason Michigan had a robust, successful net metering program. She pushed for it in the final days of the negotiations in 2008, wiling to set a cap of 1% in statute so the program could help homeowners and farmers who sought to invest their own money in a technology to move them towards energy independence and support the grid in areas of the state that needed it. Patty saw the future of our energy system and how it could embrace and support our natural resources by deploying renewables and efficiency to decrease mercury, particulate matter, and carbon dioxide. Patty was known for her legislative working groups which seeded many important policy issues that underpin our natural resources and energy policies in Michigan and the Great Lakes region today. From hours spent on water withdrawal and the Great Lakes Compact to National Pollutant Discharge Elimination System Permits (NPDES) to protecting her precious dunes, she engaged all stakeholders and leading to thoughtful, balanced outcomes. Patty again reached out for the future and across the aisle to write a bill with Rep. Dan Scripps that was a 60-page structure for offshore wind permitting. She saw that Michigan must protect our critical water resource by building a regulatory process that gave clear rules for where offshore wind could and could not but built. The effort was informed by hours of stakeholder discussions and public meetings including one with over 300 people that Patty skillfully led. After she left office, we became friends. Patty was thrilled to serve as director of the Office of the Great Lakes – a position perfect for her policy legacy. She loved the opportunity to knit together her passion for water with her passion for agriculture, business, and West Michigan in her role with the Michigan League of Conservation Voters. 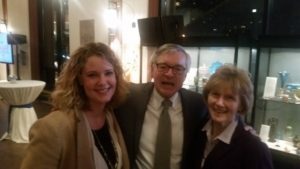 We shared a wonderful evening celebrating Mayor George Heartwell – whom she admired greatly – at his farewell party when she introduced me to almost all 300 West Michigan folks in attendance! There is a Patty-sized hole in my heart that I will try to fill with bi-partisanship, commitment to our water and natural resources, and her graciousness and love of Michigan. Renergetica, founded in Genoa in 2008, works in the renewable energy sector both as a direct investor in its own plants and as a system integrator. In 2015 it establishes Renergetica Usa Corporation which is committed in the development of the market in North America and Caribbean. Thanks to its strong financials, engineering and industrial skills, Renergetica is able to meet market demands and to manage critical conditions and challenging regulations, seizing new exciting opportunities for our customers. The Renergetica Group boasts a significant track record that includes more than 13 installed renewable energy systems, producing a total of 152 MW around the world and another 24 MWp will soon be added in Chile. In 2014 the Company launched SHES – Smart Hybrid Energy Solutions, a pioneering project aimed at micro-hybrid grids, a market forecast to grow strongly. In the next years Renergetica Usa Corporation goal is to develop 200 MW PV plants in USA and most of them are already in progress. Founded in 2000, Ameresco, Inc. is a leading independent provider of comprehensive services, energy efficiency, infrastructure upgrades, asset sustainability and renewable energy solutions for businesses and organizations throughout North America and Europe. Ameresco’s sustainability services include upgrades to a facility’s energy infrastructure and the development, construction and operation of renewable energy plants. Ameresco has successfully completed energy saving, environmentally responsible projects with Federal, state and local governments, healthcare and educational institutions, housing authorities, and commercial and industrial customers. With its corporate headquarters in Framingham, MA, Ameresco has more than 1,000 employees providing local expertise in the United States, Canada, and the United Kingdom. Cypress Creek Renewables is a nationally-focused developer headquartered in Santa Monica, California. CCR has offices in Phoenix, San Francisco, Asheville, and Durham, as well as field offices in Chicago and now Plymouth, Michigan. CCR has over a gigawatt of operating assets in 10 states, plus pending development in the Midwest, Pacific Northwest, Mid-Atlantic, Northeast, Southeast, and ERCOT (Texas). Michigan is a key growth market for Cypress Creek. In case you missed it: Last week, the House Energy Committee held a hearing on two bills (HB 5692 and HB 5693) introduced by Representative Rabhi, which would eliminate the MPSC’s controversial distributed generation tariff and reinstate net metering. Representative Gary Glenn, chair of the House Energy Committee, along with Reps. Steve Johnson, Yousef Rabhi, Tom Barrett and Rep. Scott Dianda, introduced the “Energy Freedom” bill package, which would allow customers to create community solar projects to share up-front costs for renewable energy projects and receive credits on their bill for energy contributed to the grid; allow more customers into the net metering program; allow individual renewable energy producers to create a microgrid to connect in “island mode” in the event of an outage; and create a “fair value pricing” framework to compensate renewable energy systems for energy they produce that benefits the grid. Representative Glenn expects the “Energy Freedom” package to be discussed in committee this month. The Michigan Energy Office has opened a request for proposals for projects to offer free energy management consultations to municipalities and hospitals. Enbridge, the company that owns the Line 5 Pipeline in the Straits of Mackinac and has been responsible for other pipeline oil spills in Michigan, has been fined $1.8 million for failing to adequately inspect its Midwest pipelines for weaknesses under a 2016 agreement with federal agencies. An oil spill in the Straits of Mackinac could cost Michigan’s economy $6.3 billion, according to a study. DTE Energy is seeking developers for the Conners Creek site on the Detroit riverfront this year to transform the site into mixed-use or retail space. Consumers Energy is planning to install a new gas pipeline through the Shiawassee National Wildlife Refuge. The Ecology Center and Midcontinent Transportation Electrification Collaborative released a report on utility roles in the EV market. Michigan EIBC member NextEnergy is selling the NextEnergy Center to Wayne State University to be used as an urban technology innovation consortium called Detroit Urban Solutions. S. Senators John Barrasso and James Risch introduced legislation to remove the requirement that utilities buy energy from qualifying facilities at the avoided cost rate under the Public Utility Regulatory Policies Act of 1978 (PURPA). The senators argue that PURPA is no longer a driver of renewable energy. A Vox diagram shows how much energy Americans use, what kind, and how much is wasted. New estimates show that off-grid renewables are growing rapidly. Solar and wind made up at least 94% of new U.S. generation in the first quarter of 2018. Corporate buyers are on expected to break records for the amount of renewable energy purchased in a year. A new partnership between Clean Energy Blockchain Network and Power Ledger will use blockchain technology to reduce the time and transaction costs associated with the sale of clean energy. New York state announced a plan for an ambitious 3% energy efficiency target. Wisconsin regulators voted to maintain $5.5 million a year in funding for renewable energy projects. Clean Fuels Michigan invites you to a Lunch n’ Learn on Electric Vehicles, May 10 in Lansing. RSVP to Kara Cook or Mike Alaimo. DTE Energy invites you to a Solar Celebration on May 12 at the DTE Lapeer Solar Park from noon to 4pm. No registration is required. Michigan EIBC member NextEnergy invites you to the Lites Summit in Detroit on Tuesday, May 15. The event includes an optional off-site tour with transportation to the IBEW Local 58 Zero Net Energy Center in Corktown. Register here. You’re invited to a Solar Energy 101 Panel Presentation hosted by Michigan EIBC member company Geronimo Energy on May 16 at the Country Mill Orchard, 4648 Otto Road, in Charlotte. The event consists of a social hour from 5:30pm-6pm, followed by panel presentations from 6pm-7:30pm, and another social hour from 7:30pm-8pm. Panelists from the Michigan Energy Innovation Business Council, Native Connections, the Michigan Conservative Energy Forum, and other industry organizations will speak about the solar energy industry, as well as project impacts to both local and regional communities. RSVP by calling (952) 697-3387. You’re invited to the 2018 Michigan Commercial & Industrial Energy Conference – Lower Peninsula, on May 17 in Battle Creek. The event, hosted by Michigan EIBC member company CLEAResult, provides the opportunity for business customers, contractors and industry experts to network and learn from one another. Register here. You’re invited to the U.P. Energy Summit on May 23 at Northern Michigan University. Register here. Michigan EIBC and Advancing Women in Energy (AWE) will cohost a Michigan Energy Forum on energy efficiency and lighting on June 11 in Detroit. Register here. 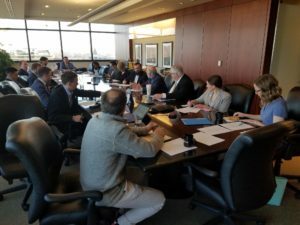 Michigan EIBC’s third EV Conveningon DC fast charging and long-dwell charging isscheduled for June 14 at the Michigan Agency for Energy’s office in Lansing. The meeting will featurespeakers including Jeff Mason, CEO of the Michigan Economic Development Corporation; Wayne Killen, Senior Director of Infrastructure Operations and Bustiness Development for Electrify America; and Robert Jackson, Director of the Michigan Agency for Energy. Register here. EUCI invites you to the 2018 Residential Demand Charges Conference, May15-16 in Nashville, Tennessee. Register here. You’re invited to the 3rd Annual Grid Modernization Forum, May 23-24 in Chicago. This event examines the latest business strategies and technology advances for implementing the distributed, intelligent, and renewables-centric grid of the future. Learn more and register here. Use code MWEN for 20% off. EUCI invites you to the Leadership Conference for Women in Energy 2018 on June 4-5 in St. Louis, Missouri. Register here. Join ACI in San Francisco on June 6-7 for Grid-Scale Storage 2018 and learn through different panel discussions, site tours, workshops, and presentations on the significant market opportunities for energy storage. Register here. EUCI invites you to the 2018 Western Transmission Summit: From Expansion to Modernization – Addressing the Changing Landscape of Transmission Planning and Investment. This event will be June 11-12in Denver, Colorado. Register here. EUCI invites you to the Electric Utilities 101 event on June 12-13, in St. Louis, Missouri. Register here. EUCI invites you to a conference on the fundamentals of overhead distribution systems on June 14-15 in Baltimore, Maryland. Register here. EUCI invites you to the Introduction to Cost of Service Concepts and Techniques conference, July 16-17, and the Introduction to Rate Design for Electric Utilities conference, July 18-19, both in Chicago, Illinois. Register for both here. EUCI invites you to the Smart Cities 2018 Conference on August 13-14 in Columbus, Ohio. Register here. The Michigan Energy Office announced the release of request for proposals for Michigan municipalities, school districts, and hospital systems to get free energy management consulting services. Interested parties should apply by emailing Allison Harris by May 18. 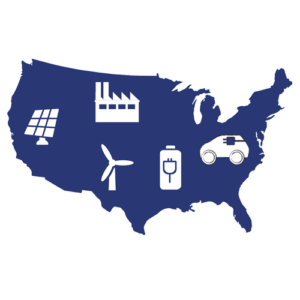 The Department of Energy has announced up to $68.5 million in funding for early-stage research of advanced vehicle technologies that will enable more affordable mobility, strengthen domestic energy security, and enhance U.S. economic growth. Projects should address advanced batteries and electrification, light-weight vehicle structures and advanced powertrains, technology integration and energy-efficient mobility systems, and engines and fuels. Concept papers are due May 29 and full applications will be due July 13. Learn more here. The Michigan to Montana (I-94) Alternative Fuels Corridor project is currently seeking project partners. Organizations that are interested in being considered for receiving federal funds should prepare a short (i.e. approximately one to three page) project description that includes the project details, projected fuel use, projected project budget (including both requested federal funds and organization supplied matching funds), and estimated timeline for completing the project. Submit your project description to Ted Barnes. The deadline to submit a proposal is May 31, with partner selections starting in June 2018. The Michigan Energy Office (MEO) today said communities have until May 31to take the Michigan Green Communities (MGC) Challenge, a contest that measures communities’ progress toward meeting their current and future energy needs. The EPA has announced the availability of $40 Million in Diesel Emission Reduction Program (DERA) funds. The deadline to apply is June 12. You can apply here.